So I made a Christmas Cake in November and never got round to finishing the icing. Luckily Christmas cake is well known for it's survivability and this one has been well fed with brandy. Place your egg whites in a bowl. A spoonful at a time mix in the sifted icing sugar. Continue adding icing sugar until the mixture falls slowly from a spoon. Using an electric whisk whisk for 10 minutes or until the icing forms stiff peaks. Add glycerine and whisk briefly. Using a large palette knife spread the mixture over the top and sides of the cake. Using a smaller knife make small peaks to create a festive snow scene look. Leave the cake out over night for the icing to harden. If like me you foolishly did steps 1-4 above and then left the cake for over a month you will find that your marzipan has gone hard. To solve this you can take a pastry brush and a cup of water. 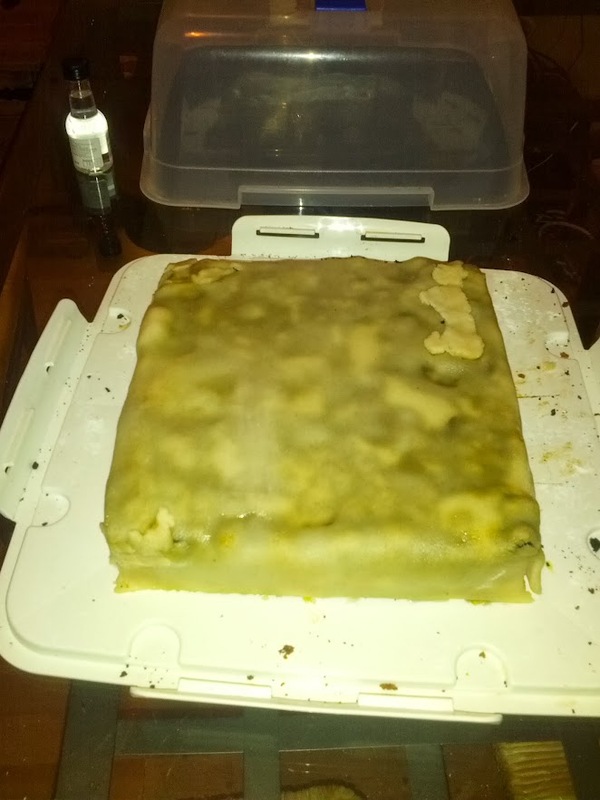 Sparingly brush water over the marzipan and leave it for about an hour. This definitely works for marzipan that has been left for a month or less. I can't guarantee it will work for older marzipan. Newer PostData Drudgery, Steampunk Stark & Tepid Tea!